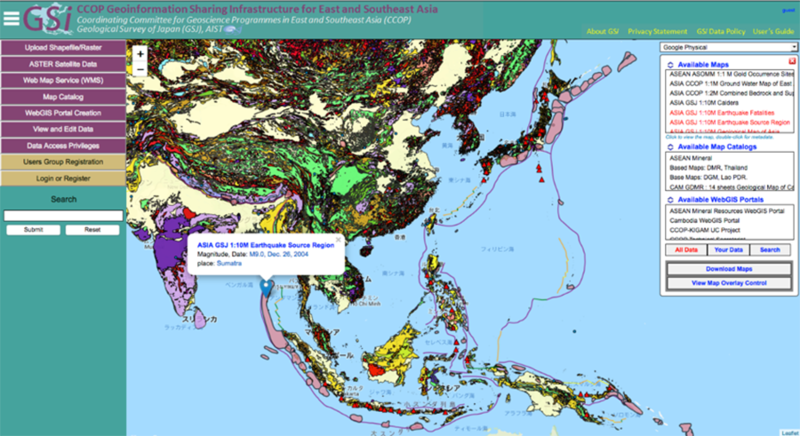 The Geological Survey of Japan (GSJ) has developed a comprehensive sharing system of Asian geoscience data among the member countries of the Coordinating Committee for Geoscience Programmes in East and Southeast Asia (CCOP). 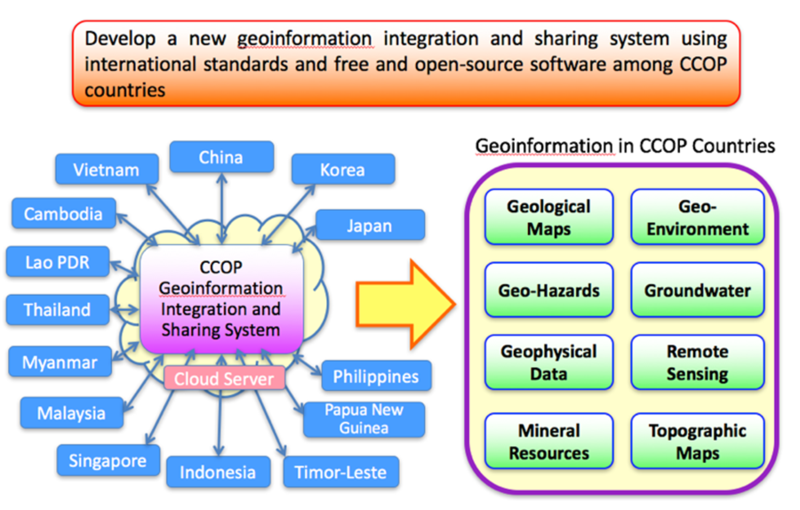 The objectives of the CCOP Geoinformation Sharing Infrastructure for East and Southeast Asia (GSi) project are (1) to promote high-quality digitization of geoscience data (geological maps, information on earthquake and volcanic hazards, geological environment, groundwater, geophysics, geochemistry, remote sensing, mineral resources, etc.) owned by the national geological survey and related organization of each CCOP member country, (2) to construct a web-based database using international standards and GIS, and (3) to establish a comprehensive geoinformation database and spatial data infrastructure (Fig. 1). The duration of the project is six years from 2015 to 2020. The project aims to make geoscience information covering East and Southeast Asia highly accessible and utilized around the world, collaborating with similar international projects such as *OneGeology. GSJ is playing a leading role in developing the system as the comprehensive database for the geoscience information in the region. The first version of the GSi system was officially opened to the public during the 3rd CCOP GSi International Workshop in Langkawi, Malaysia on September 18-20, 2018 (Fig. 2). *OneGeology: Geological Survey initiative project, which will make public and Internet-accessible the best available digital geological map data and all forms of relevant Geoscience digital data worldwide to better address the needs of society. The concept of the CCOP Geoinformation Sharing Infrastructure Project.